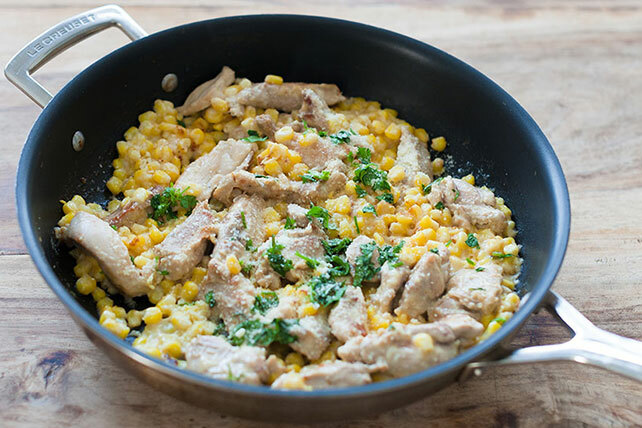 Delight your loved ones today with our Mexican Chicken and Corn Skillet recipe. Our elotes inspired Mexican Chicken Corn Skillet features a blend of mayo, lime juice and chipotle powder. Add a sparkle of Parmesan cheese and cilantro to garnish the dish perfectly. Heat oil in large skillet on medium heat. Add chicken and seasonings; cook and stir 4 min. or until chicken is done. Add corn, mayo and lemon juice; cook and stir 3 to 4 min. or until heated through. Stir in 2 Tbsp. cheese. Sprinkle with remaining cheese and cilantro. Serve over hot cooked rice or in warmed corn tortillas. Prepare recipe as directed, except omit cheese and cilantro. Cut lengthwise slit in each of 6 roasted poblano chiles; fill with chicken mixture. Place, filled sides up, in 13x9-inch baking dish sprayed with cooking spray; cover. Bake in 350°F oven 15 min. Sprinkle with 1/2 cup shredded Chihuahua cheese (asadero); bake 5 to 6 min. or until melted. Substitute 1 (10 oz.) pkg. of frozen mixed vegetables (carrots, corn, peas) for the corn.